A Vendor is a person or a company who sell their products to you, and you purchase items from them to add to your inventory and to sell them. When adding inventory and creating a purchase you are required to enter the vendor's information for the software to keep track from whom the products have been purchased from. First Click on the New tab. In the Vendor name field, enter the vendor name. 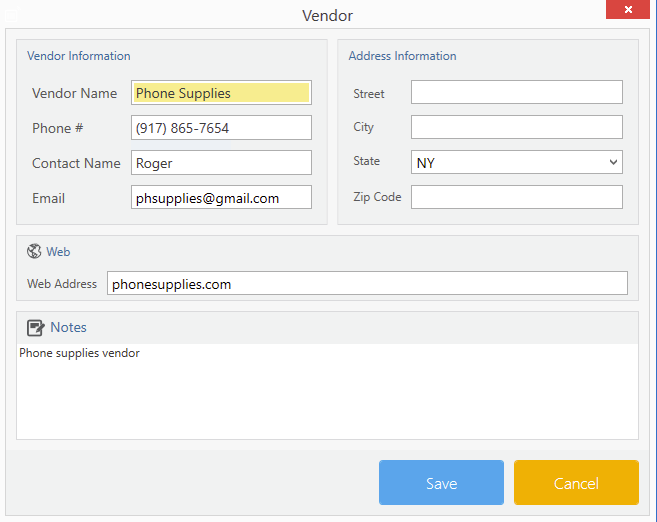 Click save to create the vendor. You may enter any vendor notes while creating a vendor. These notes will not be printed and are only for the users. You may edit/delete a vendor by going to the list of vendors.